You can use Bulk import to import big number of products at once . Go to Import Products section of AliPlugin Pro, choose Bulk Import and make sure you have installed AliPluginPRO extension before you start. This extension can be used for the Google Chrome browser only. You need to open aliexpress.com in the next tab and sign in before you start. 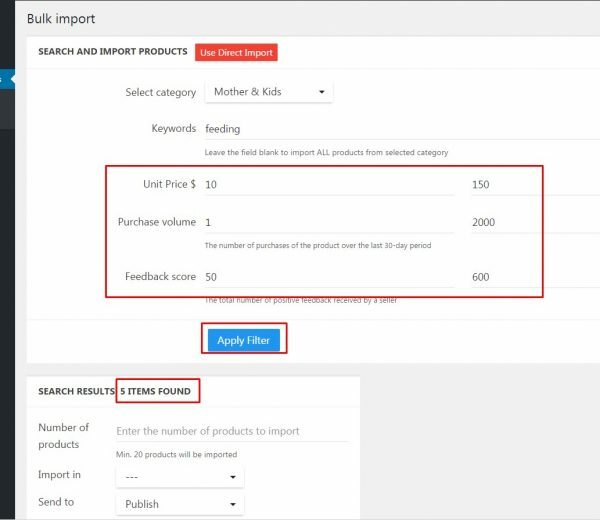 In the Import Products section of AliPlugin Pro you need to choose Bulk import tab. Select a category you want to be looking for products in. You can leave this field in the default state “All categories”. Type in searching keywords in English. Type in the number of products you want to import. Above this field you can see the SEARCH RESULTS line with the number of found products. This is the max number you can import. The minimum is 20 products. Select a category you want to import products in. Note that you need to create the categories before you can import products in them. You can send the imported products in Draft and publish them later if you want. The default option is Publish, which means the imported products will appear on your site. After the import begins you will see the links from AliExpress to the products you are currently importing. After the import is completed the progress bar will show 100%.